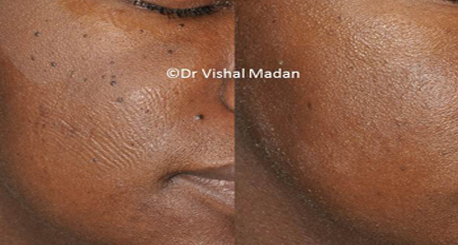 Darker skin patients may develop small skin tag like lesions called Dermatosis Papulosa Nigra and can be effectively treated using the carbon dioxide laser. Procedure is simple and undertaken using anaesthetic cream only. Ali FR, Bakkour W, Ferguson JE, Madan V. Carbon dioxide laser ablation of dermatosis papulosa nigra: high satisfaction and few complications in patients with pigmented skin. Lasers Med Sci. 2016 Apr;31(3):593-5.